Eco-Friendly Everyday - Pure & Natural. Continuing on with our celebration of Earth Day and going Green this week, it’s important to remember how using eco-friendly products protects both you and the environment- and it’s best to start with your shower and bath products! Pure & Natural is the perfect way to start. All of the Pure & Natural products are eco-friendly, with the cleansing bar having biodegradable packaging embedded with seeds so when you plant it baby’s breath will grow. Also, the company donates a minimum of $100,000 annually to World Wildlife Fund as a commitment to protecting the future of nature. 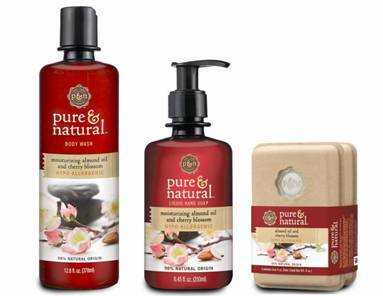 Pure & Natural consists of three new products including a Body Wash, a Liquid Hand Soap and Bar Soap, each reflecting a comprehensive environmentalist standpoint. All Pure & Natural products are biodegradable: the Body Wash and Liquid Hand Soap packaging are 100% recyclable, and the Bar Soap packaging, like I said, is made of 100% post consumer paper with seeds embedded inside. Love that! These new products contain ingredients that come together to moisturize, cleanse and renew skin. Enriched with pure glycerin , all three products are hypoallergenic to leave skin feeling soft, clean and healthy. Almond Oil & Cherry Blossom : to moisturize, nourish and soothe skin. Rosemary & Mint : to cleanse, refresh and revive skin. Grapefruit & Pomegranate : to gently exfoliate and renew the skin. Pure & Natural products can be found at mass retailers nationwide.